Thanks Everyone! 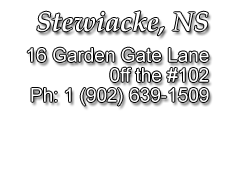 We are now back at home in Stewiacke! No Surprises! Tax Included in Our Payments!! Note that by supplying us with the above information, you are authorizing Pine Acres RV to review your credit for the purpose of buying a vehicle. Providing us with the above information in no way obligates you to purchase anything. By law, we are required to hold the information you've provided us in strict confidence. Pine Acres RV has access to multiple financial institutions. That means we can provide the financing you need at a monthly payment that fits your budget. In submitting this application to Pine Acres RV, I understand that Pine Acres RV will supply the above information to one or more credit bureaus in order to receive information about my credit history. Also, in submitting this credit application I understand that Pine Acres RV may provide the above information, and my credit history, to one or more financial institutions in order for them to evaluate their willingness to finance a vehicle(s) to me. Please review your application to make sure all applicable fields are completed. Incomplete applications will cause delays in processing your request. Please type the following code in the space available below to validate your form.